THIS PISTOL IS USED IN EXCELLENT CONDITION. 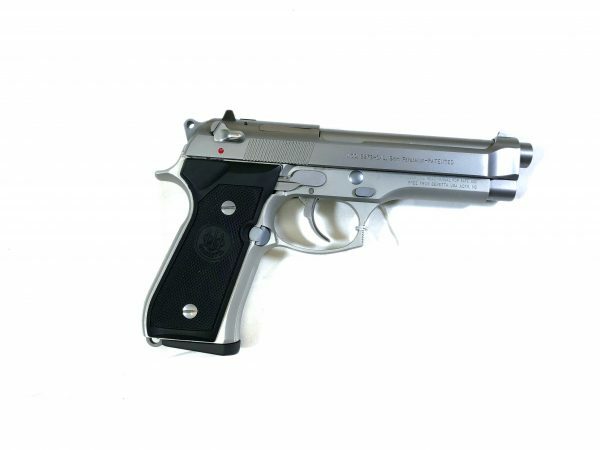 The Beretta 92FS Inox gives you all the features of the legendary 92FS or M9 (the official sidearm of the US military), in a rugged and attractive satin stainless steel finish. The slide, barrel and internal parts are all stainless, while the alloy frame is anodized to match the color and finish of the other components. It also features stippled-textured soft rubber grips that further absorb recoil while affording a firm and positive grip. Besides being one of the most photogenic handguns ever made (it appeared in countless movies and TV shows), it is perfect for home or personal defense, as well as concealed carry and recreational shooting.